Professor Ross Crawford undertakes public clinical practice at the Prince Charles Hospital and private practice at the Holy Spirit Northside (HSN) Hospital. He performs around 400 total joint replacement surgeries/year and trains junior orthopaedic surgeons. Both hospitals are tertiary referral centers for complex and failed surgery from around Queensland. 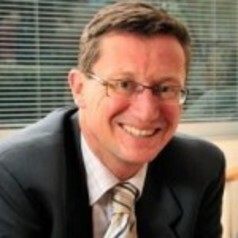 Professor Ross Crawford is a member of the medical advisory committee at the HSN. HSN recently purchased a MAKO robot to perform knee replacement surgery and the hospital has performed the most surgeries in Australia. Robotic hip replacement surgery will be introduced to Australia in 2016 with Professor Crawford to perform the initial operations. To date Professor Crawford has graduated over 30 PhD students and currently supervises 10. A number of these researchers are working in robotics. Of note he has graduated 5 orthopaedic surgeons to PhD meaning that QUT is currently the most active university in the country linking clinical orthopaedic research with academia. Stryker Corp is a fortune 500 USA based medical device company. Their largest selling total hip replacement is the Exeter hip. Professor Ross Crawford is a design surgeon for the Exeter hip. He also consults to Stryker on robotic hip surgery and is part of the development team for robotically assisted hip replacement surgery. The Queensland Government Smart State Facility Fund awarded $5,000,000 to QUT in June 2004 to establish the Medical Engineering Research Facility (MERF) at the Prince Charles Hospital Chermside (Opened March 2008). Ross Crawford was part of the team who won this prestigious bid and was appointed the director of MERF in 2010. Professor Crawford oversees the world-class operating theatres (used predominantly for cadaveric training and research), cell culture facilities, mechanical testing and animal models that are located at MERF and consults on all aspects of research undertaken at the facility. MERF was designed to meet Australia’s emerging needs in orthopaedic and artificial organ research. It provides a comprehensive suite of research and training facilities in one location. MERF will be an important facility to allow researchers in medical and healthcare robotics to develop applications that will be able to be translated directly to human use. Professor Crawford teaches undergraduate medical students and lectures to undergraduate engineering students at QUT. He teaches internationally on orthopaedic techniques and has lectured and operated in India, China, Turkey, and the UK. He has lectured in over 10 further countries including USA and Japan.